Please also check our Facebook page for the most recent events news. 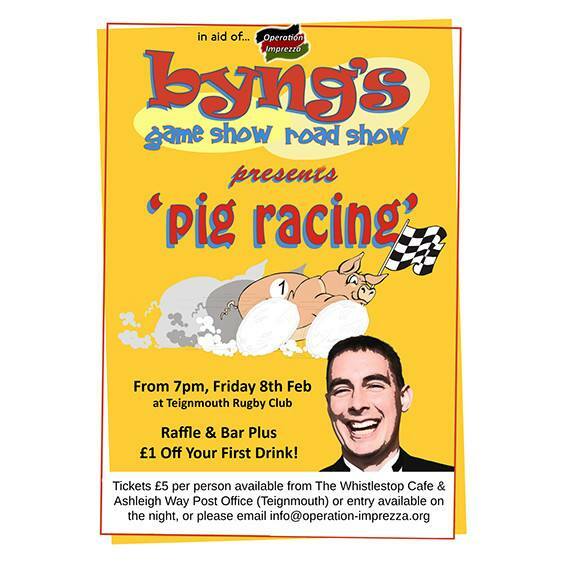 Tickets are now on sale for Byng's 'pig racing' game show (don't worry, no real pigs are involved!). The event was a big success last year and guarantees an evening of silly, good-natured fun'. Held at Teignmouth Rugby Club. Tickets £5 per person available from The Whistlestop Cafe, Teignmouth Train Station and Ashleigh Way post office, Teignmouth or on the door. Murder Mystery Meal - How Do You Like Your Stake? Hosted at the Trade Winds Restaurant in Teignmouth, this murder mystery dining experience provided by Moonstone Theatre Company will ensure a fantastic night out! Tickets £27.50 per person for a 2 course meal and tea/coffee. Tickets available to purchase at the Whistlestop Cafe, Ashleigh Way Post Office in Teignmouth and Bishopsteignton Stores. ​Book soon to avoid disappointment! of support for Imprezza Academy in Western Kenya, with an evening of light refreshments, entertainment by some of the Torquay Girls’ Grammar School students and messages from Kenya and trustees past and present. If new to us you are also very welcome to find out more about Operation Imprezza and Imprezza Academy. Join us on our river cruise, departing Totnes at 7.15pm (boarding from 7.00pm) and returning to Totnes by 10.30 p.m. There will be a band and buffet on board inclusive of the ticket price with a separate bar. Spaces are of course limited so please book in advance to make sure you don't miss out. Tickets are £25 per person and are available from The Whistlestop Cafe, Teignmouth Train Station, Ashleigh Way Post Office, Teignmouth and Torquay Girls Grammar School (main Office) or you can contact us on 07887383020 (Bob) or phone Chris on 01626 777419. Hi De Hi with the Moonstone Theatre Co.
Once again, Moonstone Theatre Co. are putting on a fantastic interactive dining experience at the Trade Winds Restaurant in Teignmouth, this time with the characters from the ever popular TV series 'Hi De Hi'! We can't wait to see how this one unfolds, you're guaranteed a night of belly laughs and great food. Tickets are £25 per person, which includes a 2 course meal and tea/coffee. Tickets available to purchase from the Whistestop Cafe, Teignmouth train station or Ashleigh Road post office, Teignmouth. Tickets are £10 per person, and you will receive £1 off your first drink. Tickets available to purchase from Whistlstop Cafe at Teignmouth Train Station, Ashleigh Post office in Teignmouth or by calling Chris on 01626 777419. Teignmouth Sings, a local community choir for people who like to sing for fun, will perform a repertoire of popular music at The Riviera, Teignmouth in support of three local charities. This will be the first live performance in the auditorium for over 12 years, so we are very exited to hold this special event. Tickets are £7.50 and are available from Ashleigh Way Post Office and The Whistlestop Cafe in Teignmouth, or please contact Chris on 01626 777419 or email info@operation-imprezza.org. Another hugely successful evening of food and entertainment was enjoyed by over 60 diners, possibly the best of these events yet! A huge thanks to the fantastic catering by Trade Winds and superbly entertaining performances by Moonstone. Three pictures were auctioned at the raffle and amazing generosity from everyone - thank you all for taking part in such a fun evening. Murder Mystery & Dinner Evening "Death Under The Big Top"
Yet another fantastic evening from Moonstone Theatre Company, enjoy a two course meal alongside a murder mystery with a circus theme! Tickets £25 per person and as usual tickets available from the Whistlestop Cafe and Ashleigh Way Post Office, Teignmouth or please email us info@operation-imprezza.org or phone Chris on 777419. We will be hosting an evening at the Whistlestop Café, Teignmouth to discuss our latest progress, ongoing projects at Imprezza Academy, and our upcoming ambitions to raise awareness, support and donations for Imprezza. If you have any questions, are curious how you can contribute, or just want to hear our latest news, we'd love to see you there from 7pm! Free for all to attend, refreshments will be provided and please bring along anyone you think might be interested in what we do. 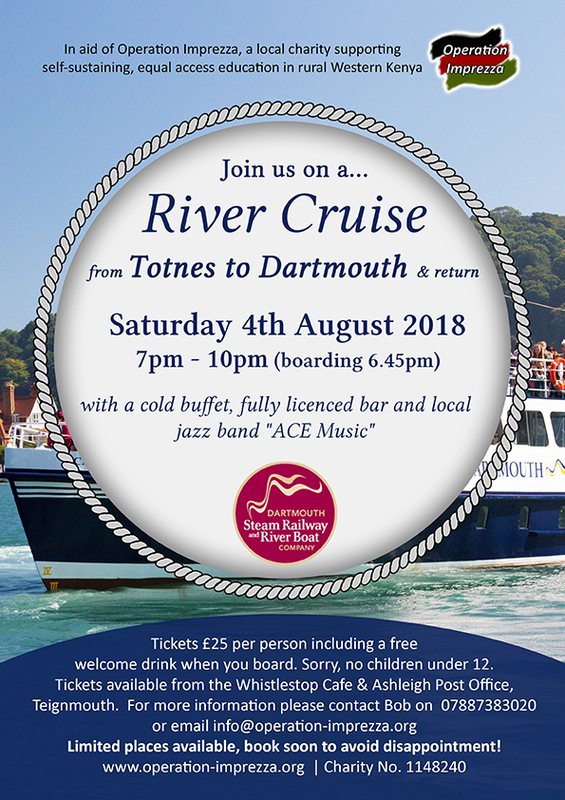 Join us on a cruise on the River Dart from Totnes to Dartmouth and back again, with a cold buffet, fully licenced bar and local Jaz band 'Teign Pan Alley'. Run by the Dartmouth Steam Railway & River Boat Company, boarding is from 6.45pm departing at 7pm from Steamer Quay Road, Totnes. Tickets £20 per person including a free welcome drink when you board. Sorry, no children under 12. Tickets available from the Whistlestop Cafe and Ashleigh Post Office, Teignmouth. 'Allo 'Allo - Moonstone Theatre, an evening at Cafe Rene! Experience the fun and capers of the TV series at this extraordinary interactive dining experience. The talented Moonstone Theatre company will be playing the parts of Rene and his friends as you enjoy a two course meal. Limited places available to please book soon to avoid disappointment! Tickets available from the Whistlestop Cafe at Teignmouth train station and Soula's Deli in Teignmouth. Tickets £25 per person. The event will be held at the Trade Winds Restaurant in Teignmouth from 7pm. Come and have some retail ﻿therapy at our fashion show with clothes and accessories from Hoopers department store, Rosie & Jims, Little Cherubs, Attic and Lazy Jacks. Held at the Torquay United Football Club there will be light refreshments and Jazz music. Kevin Nicholson, player manager at Torquay United will be taking part, as well as two of the young first team players James Hurst and Dan Butler. Tickets £5 available from Hoopers in Torquay, The Whistlestop Cafe in Teignmouth, Torquay United Football Club, or call Chris on 01626 777419. ﻿﻿﻿A huge thanks to both everyone that attended the event on Saturday and to Moonstone Theatre Company for providing one of the best night's entertainment of the year so far. We raised £290 and had a fantastic evening. Well done to Lizzie who ran the Bath Half Marathon on Sunday 1st March along with approx 12,000 other runners. We're still waiting for confirmed time but Lizzie managed to complete it in just over 2 hours, a fantastic achievement! If you'd like to contribute sponsorship please visit her Virgin Money Giving page here. Thank you for your support! Come and see our display at Teignmouth Arts Action Group! We're on display at the TAAG centre in Teignmouth from 11th - 23rd January located on Northumberland Place. Christmas Bird Boxes, Table Wreaths and More! Thanks to everyone who attended the event, the fund raiser was a success and we managed to raise around £215 despite the rain stopping us around lunch time! Exeter's Great West Run is a 13.1 mile half marathon through the heart of Exeter. We currently have two sponsored runners, Jonny Gurr and Rob Wills. To find more about the race click here, or if you would like to participate and raise money for Operation Imprezza please contact Bob Cross (bob@operation-imprezza.org). You can also sponsor our runners by giving a donation via the big red button above. A huge thank you to everyone who helped make the 24hr Music Marathon Challenge "Music Around the Clock" a success - over £600 was raised for Imprezza over the 24 hour period with more than 130 musicians participating and over 20 different musical instrument represented. We even had a video stream from the USA as the Science Festival Chorus from Massachusetts prepared for their two concerts over the weekend, courtesy of David Haines, Musical Director of Teignmouth Community Choir and current songwriter-in-residence in Cambridge Massachusetts. The rehearsal was watched at 3am in Torquay, along with a number of DVDs of songs contributed by various local primary schools to ensure that music was playing continually throughout the 24 hours. A special thanks to Ian Stevenson who co-ordinated the event. Not only did he sing and play the guitar, he also introduced acts, thanked them, help set up individuals and bands, provided technical know-how and generally kept everyone going - an absolute star! The car wash was a roaring success with Lustleigh Scouts raising a whopping £283 for Imprezza! The scouts were great, they worked really hard and celebrated at 12 noon with a well deserved water fight - there was not a scout standing who was not dripping with water!! On their request the money raised will go towards Elizabeth's medical bill. A HUGE thanks to all that participated, scouts, leaders and donators alike, and a special thanks to two cyclists from Penzance passing through Dartmoor who stopped for a coffee and cake and paid £10 to have the 2 bikes washed.